The footpath along the north shore of Loch Sligachan was once the main route north to Portree; today it gives a pleasant, peaceful walk with good views; you can have a drink at Sligachan before heading back. Good path until the final section near Sligachan; the route is boggier here and there are two streams to cross which may be awkward in wet weather. Bus number 59 has a daily service, two on Fridays. Get off at Peinachorran where the bus turns round. 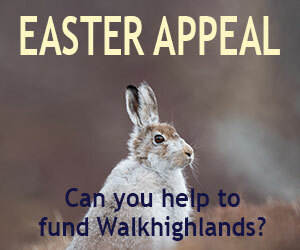 Alternatively, do the walk from the Sligachan end which is served by more regular buses. Car park at end of the Braes road. Open start point in Google Maps for directions. Park at the end of the Braes road; there is a parking area just beyond the turning area. The walk starts at the signpost for Sligachan; slope uphill on this first section and you'll soon reach a much better path at a slightly higher level. There are great views across to the pier at Sconser across the water and you might see the Raasay ferry pulling in and out. The path soon descends to a large cairn on the shore. Beyond the cairn, the path reascends and generally keeps about fifty feet above the water from here on. The route crosses several small streams, the first of which is wooded above the path and has a fine waterfall. The route continues for about three kilometres in a similar fashion. Glamaig looks impressive across the water, its steep northern slopes of broken rock and scree looking quite unassailable, whilst the view of the Cuillins ahead improves with each step. Eventually the steep slopes on the right lessen and a bigger stream is reached beneath a prominent waterfall. It is possible to cross this using stones unless the water is in spate. Beyond the path is less clear; keep the salt flats just to the left and the moorland to your right. After crossing several small streams, a larger one is reached just four hundred metres short of the campsite. The bridge marked on the OS map here is a figment of the mapmakers imagination. There are stepping stones across but these may be covered, in which case it is easier to cross slightly to the left where the water is shallowest. Beyond, the path soon reaches Sligachan campsite; continue through this to reach the main road and the hotel if needed. The return is the same way.